For the dressing, peel and pit some of the avocado. Add avocado, lime juice, cilantro, agave syrup and water to a liquid measuring cup. Season with salt and pepper to taste and blend until smooth. Set aside. Wash and clean spinach. Slice cucumber. Halve, pit and slice remaining avocado. Cut broccoli into florets. Add salted water to a pot and bring to a boil. Add broccoli florets and cook for approx. 7 min. or until tender. Remove broccoli from water and set aside. Add peas to the still simmering water and cook for approx. 3 min., then drain. 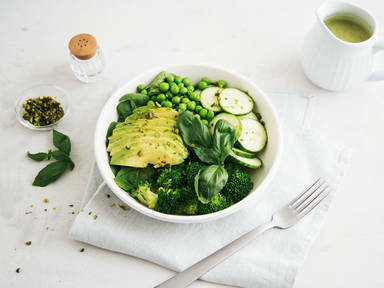 Arrange spinach, broccoli, cucumber, peas, and avocado in bowls. Garnish with basil and chopped pistachios and drizzle avocado dressing on top. Enjoy!